This section is from the book "A Research On The Eucalypts Especially In Regard To Their Essential Oils", by Richard T. Baker, Henry G. Smith. Also available from Amazon: A Research On The Eucalypts And Their Essential Oils. This terpene is somewhat extensively distributed in the oils of certain groups of Eucalypts, being more pronounced in those belonging to the more recent end of the genus, and to occur more abundantly in those species common to the Eastern and South-eastern portion of the Continent, and Tasmania. It is a somewhat uncertain terpene, as it can only be detected in the oils of some species when these are distilled at particular times of the year, being apparently absent at other periods. This peculiarity is specially noticeable with those species which are apparently on the border line, as it were, of phellandrene production, as for instance with some of the " Boxes," and species closely associated with these. The phellandrene in Eucalyptus oils has usually a high rotation to the left, so that the diminution, or otherwise, in the normal optical rotations of the crude oils of some species is traceable to the influence of this terpene, consequently the rotation constant is less stable with the phellandrene bearing Eucalyptus oils than with those in which the predominant terpene is pinene. This difference is more distinctly marked with the oils of those species in which dextro-rotatory pinene and lavo-rotatory phellandrene occur together in some quantity, and the instability of rotations of the phellandrene in these cases is distinctly noticeable. The influence of dextro-phellandrene is also shown in some of the more pronounced phellandrene oils at certain times of the year. Unlike pinene, which occurs in both active forms, phellandrene in any Eucalyptus oil has not yet been found in which the dextro-rotatory modification predominates, although the great differences shown in the magnitude of rotations with the oils of the several species in which this terpene occurs, suggests the presence of both active forms. Lsevo-phellandrene is thus the predominant form in Eucalyptus oils, and as practically all those of the phellandrene-bearing Eucalypts have now been investigated, it is hardly likely that the dextrorotatory modification will now be found to be present in excess in the oils of this genus. Phellandrene in Eucalyptus oils is often associated with lævo-rotatory piperitone, but not always, although it may be accepted that the most pronounced phellandrene Eucalyptus oils always contain this ketone in smaller or larger amounts, in ordinary distillates from 5 per cent. in that of E. radiata, to 40 per cent. in that of E. dives. It is unnecessary to enumerate here those Eucalyptus species in the oils of which phellandrene has been detected, as they are somewhat numerous, but they will be found recorded in the table of general characters and principal constituents. Phellandrene was isolated and named by Pesci in 1884 (Gazz. Chim. 16, 225), who obtained it from "Water fennel" oil (Phellandrium aquaticum). The terpene he prepared had specific gravity at 10° C. = 0.8558, and specific rotation [a]D + 17-64° (Heusler, Chemistry of the terpenes, p. 109.) Dextro-rotatory phellandrene has, however, been found to occur in the oils of some plants with a much higher rotation than that shown by Pesci. Laevo-phellandrene from Eucalyptus oil has previously been shown to have a particularly high rotation, and Schimmel and Co. have recorded the following constants for a sample they prepared: - Boiling point 173-175° C. (754 mm. ); 50-52° (5 mm. ); specific gravity at 15° C. = 0.848; optical rotation aD - 84.10°; refractive index at 20° = 1.47694. We have prepared a sample of phellandrene from the oil of E. dives, in as pure a condition' as possible, which had a considerably higher rotation than that recorded by Schimmel and Co. Our sample gave the following constants: - Boiling point 61° (11 mm. ); specific gravity at 15° C. = 0.845; optical rotation aD - 102.1°; refractive index at 20° = 1.4740. The nitrosite, as first prepared, melted at 110.111° C. and had specific rotation, in chloroform solution, [a]B + 134.8°. This sample possessed the highest rotation to the left of any of those we have so far prepared. In 1903, Semmler [Ber. 36 (1903), 1749] showed that crude phellandrene from Eucalyptus oil contained two isomeric phellandrenes, together with small quantities of cymene and cineol. The phellandrenes on oxidation with potassium permanganate gave distinct acids, and from the study of these oxidation products he considered the acids to have been derived from two different isomeric phellandrenes; to these he gave the names normal-phellandrene and pseudo-phellandrene. 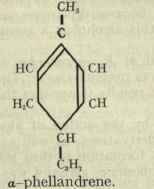 In recent determinations these isomers are usually referred to as the a- and β-forms of phellandrene. Wallach and Beschke [Ann. 336 (1904) 9] undertook an extensive investigation with the phellandrenes, and the conclusion to which they arrive is that lævo-phellandrene from Eucalyptus oil is l-a-phellandrene. It appears, however, that both the /-a-phellandrene and the l-β-phellandrene do occur in Eucalyptus oils, but where the line of demarcation exists in the genus is not at present clear. It is probable that the β-form is present in greatest abundance in the oils of those species in which the cyclic aromatic aldehydes occur, as for instance those of certain "Boxes," because cymene is always a pronounced constituent in the oils of this group, whereas in those of the "peppermint" group of Eucalypts, the principal phellandrene is the a-form, and associated with piperitone. It would thus be interesting to know from which Eucalypt the oil upon which Semmler worked was derived. Both the a- and β-forms of phellandrene have been synthesised, the normal or a-form by Harries and Johnson [Ber. 38 (1905) 1832], and the pseudo or β-form by Kondakow and Schindelmeister [J. pr. Ch. II, 72 (1905) 193]. The normal or a-form was prepared from the ketone carvone. The required menthenone was first made, and this when treated with phosphorus pentachloride formed the required chlorophellandrene, which on reduction with zinc dust in methyl alcohol was converted into a-phellandrene. The pseudo or β-form was also obtained through carvone, the tertiary carvomenthene being first prepared. This hydrocarbon reacted with bromine to form the dibromide, and this substance, when treated with alcoholic potash, formed the β-phellandrene. The normal or a-phellandrene was also synthesised from Sabina ketone by Wallach and Heyer [Ann. 359 (1908) 2652-2686]. Phellandrene readily yields a nitrosite CIOHl6N2U3, and this reaction is employed for the detection of this terpene in Eucalyptus oils; it may be carried out in the following manner: - 5 c.c. of the oil to be tested are dissolved in 10 c.c. of petroleum ether, and to the mixture is added half the volume of a saturated aqueous solution of sodium nitrite; 5 c.c. of glacial acetic acid are then added in order to liberate the nitrous acid. The amount of resulting crystalline compound will serve to indicate whether much or little phellandrene is present in the oil, this result being confirmed by the physical properties of the particular sample. If desired the crystals may be recovered by filtration, washed with water and alcohol, and then dissolved in chloroform and again precipitated by the addition of alcohol. The nitrosite from the laevo-rotatory phellandrene is strongly dextrorotatory, while that from dextro-phellandrene is laevo-rotatory, but both are similar in appearance and melt at the same temperature. They have been shown by Wallach and Beschke (loc. cit.) to form two isomeric nitrosites, which may be separated by crystallising from acetone and alcohol; the laevo-a-phel-landrene-a-nitrosite melting at 112-113° C, and the laevo-a-phellandrene-β-nitrosite at 1050 C.; the dextro forms melted also at the same temperature.